So, as you know, tv movies are not included in the official list of Guttenberg Project films. But, for special Santa-related films and special requests, I am ready to make an exception. 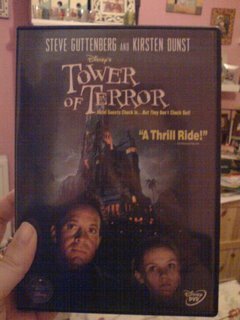 I've just read the entirety of the Steve Guttenberg project and cannot believe there is no mention of the Tower of Terror. Perhaps it is just one of the remaining 11 films for you to collect but please I am breathlessly awaiting your comments on this film. There were also some comments about a film about the true love between a dog and a dolphin, which I am unable to repeat because you would not believe me and also I would be killed. So, by special request - the fabulous 1997 TV movie Tower of Terror. And yes, you're not going crazy or seeing things. That does read Steve Guttenberg and Kirsten Dunst. 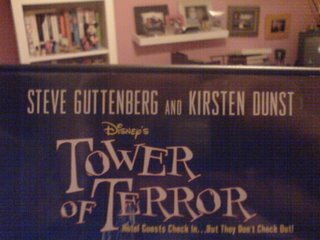 Post-Jumanji and pre-The Virgin Suicides, Kirsten made the wise decision to star with our good buddy Steve in a TV movie based on a ride at Disney World. Clearly. I've actually seen this movie many times. Okay, maybe not "many". But definitely more than once. Steve plays "Buzzy" (and no, I am not making that up), a tabloid reporter who makes up stories involving ghosts and whatnot for his paper. He's the wacky uncle of Anna (played by Kirsten) , who helps him out with his stories. A seemingly innocent old lady invites to investigate the mysterious Hollywood Hotel (I think that's what it's called - I can't actually remember) which has been closed since the 30's, after a group of people mysteriously disappeared in the elevator, including the famous Shirley Temple-alike Sally Shine. Because you know how often valuable LA real estate just sits empty for sixty years. Despite the fact that Buzzy is supposed to be a journalist, he does absolutely no research whatsoever, and just seems to believe that no one will ever lie to him. Despite the fact that almost everyone in the film lies to him. "What? You say that the evil nanny was actually a witch and hated Sally, and was therefore responsible for the mysterious elevator disappearance? And you were there, so that's how you know? Well, okay! I'll just take your word for it! No, no, I don't need to know why you were there, or anything about you. I'll just go off an investigate now. La la la la." That takes a bit away from the big climactic scene where it's revealed that (SHOCK!) the seemingly innocent old lady is actually (HORROR!) the sister of Sally Shine, and the one responsible for the mysterious disappearance because (SHOCK!!) she was jealous that her sister got all the attention. And the big twist? They were taking the elevator up to sister's surprise birthday party, but never made it. See? Seemingly innocent old lady as a child wasn't really ignored at all! I'm probably taking this film too seriously - after all, it was specifically created to provide backstory to a DisneyWorld ride. I guess I should just be glad it has a plot of any kind. And seeing Kirsten Dunst slum it is always amusing.